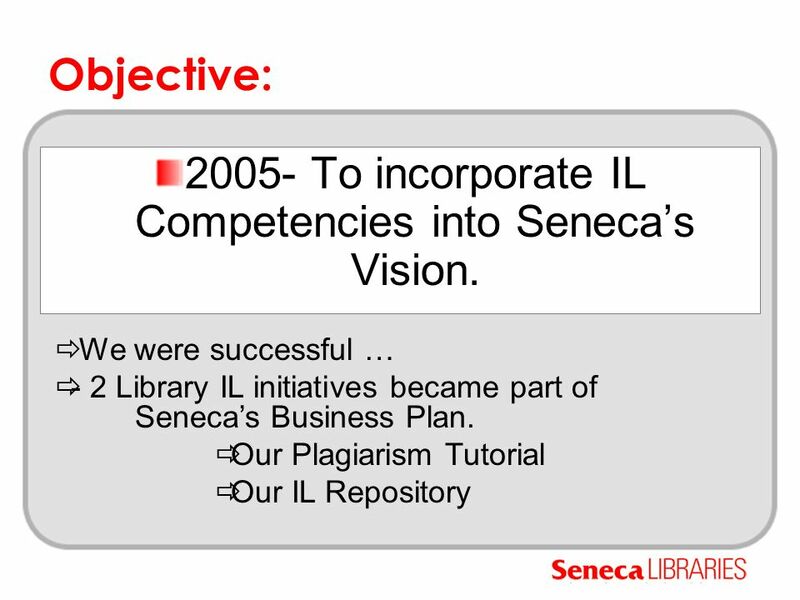 Information Literacy Roundtable April 2007 What does Seneca look like? 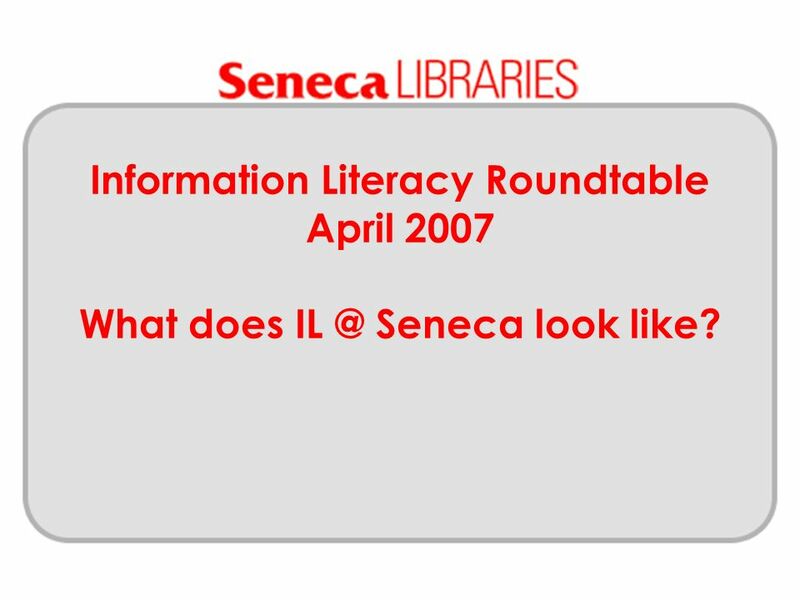 1 Information Literacy Roundtable April 2007 What does IL @ Seneca look like? 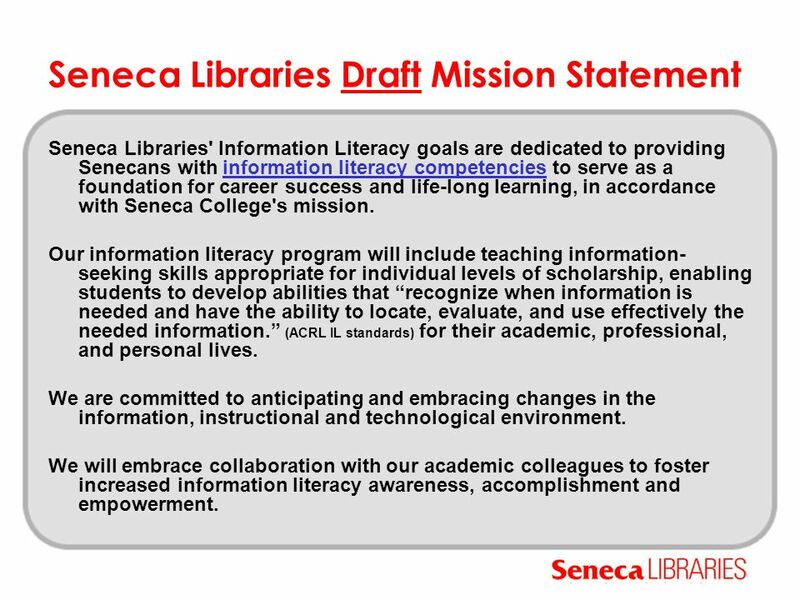 4 Seneca Libraries Draft Mission Statement Seneca Libraries' Information Literacy goals are dedicated to providing Senecans with information literacy competencies to serve as a foundation for career success and life-long learning, in accordance with Seneca College's mission.information literacy competencies Our information literacy program will include teaching information- seeking skills appropriate for individual levels of scholarship, enabling students to develop abilities that recognize when information is needed and have the ability to locate, evaluate, and use effectively the needed information. 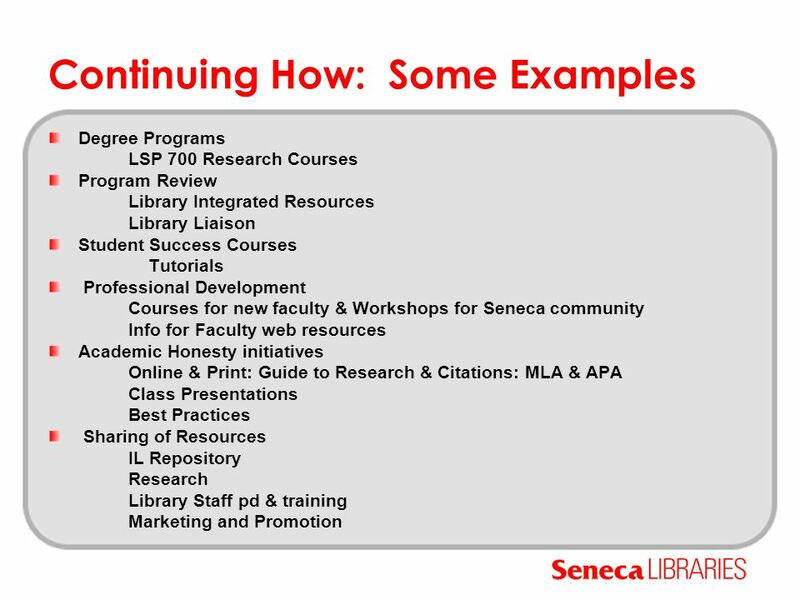 (ACRL IL standards) for their academic, professional, and personal lives. 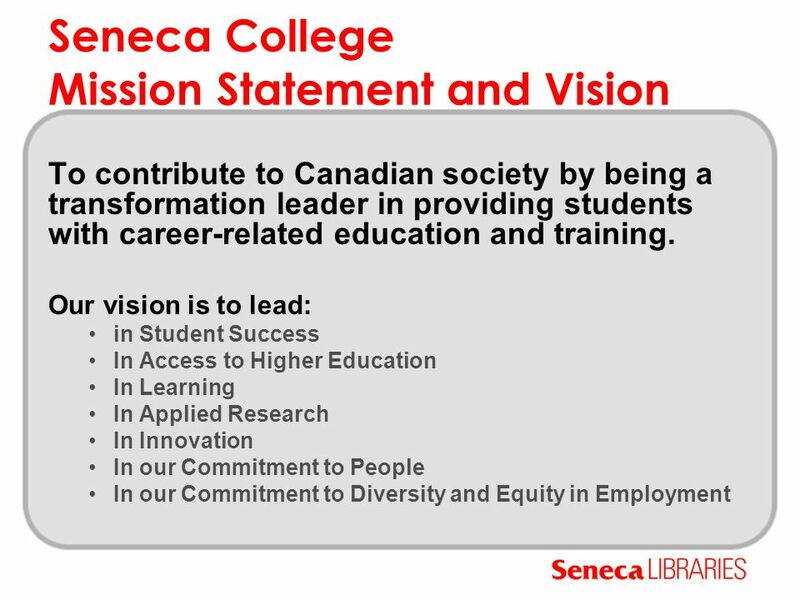 We are committed to anticipating and embracing changes in the information, instructional and technological environment. 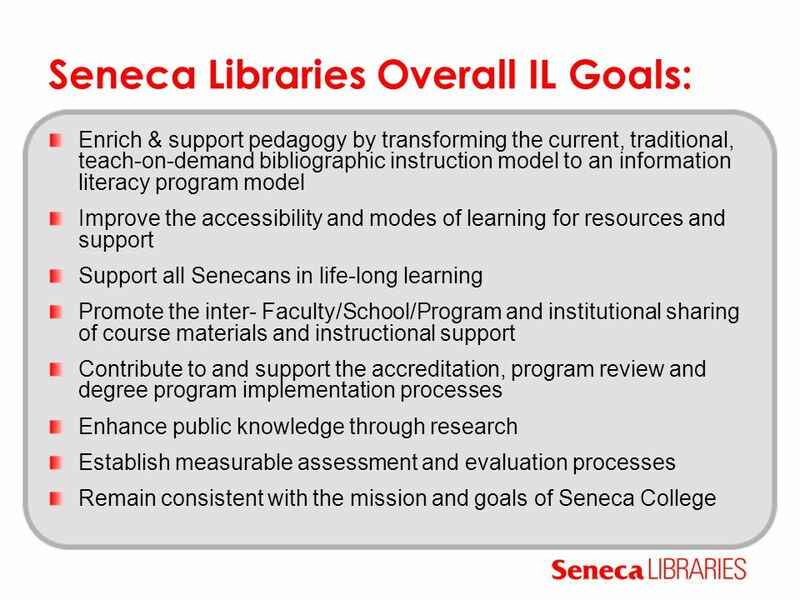 We will embrace collaboration with our academic colleagues to foster increased information literacy awareness, accomplishment and empowerment. 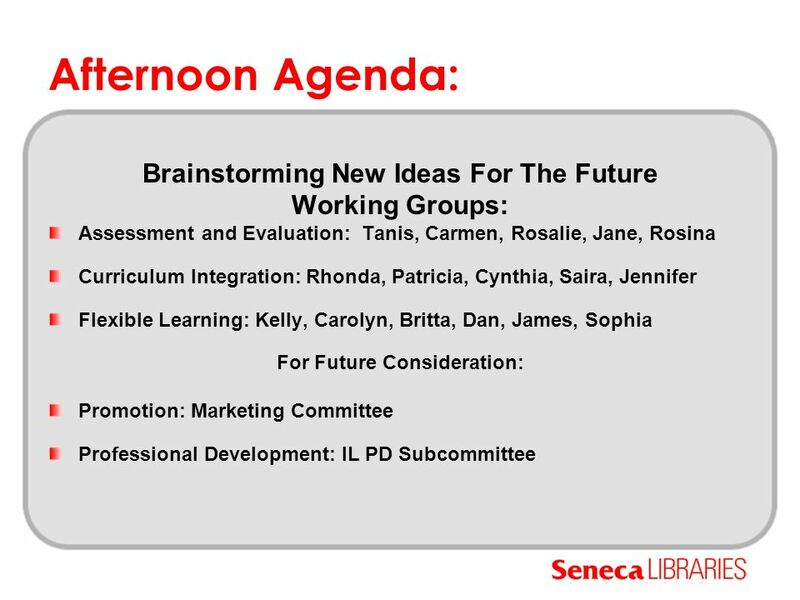 12 Future Initiatives? ? Assessment: SAILS; Presentation evaluation methods ? Access: more personalization access options through technology ? 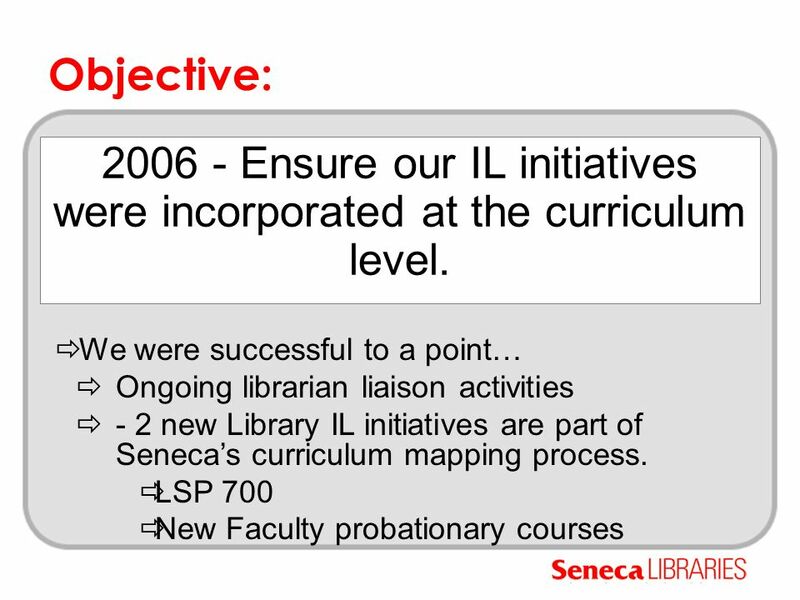 More integration with courseware; faculty liaison; resource awareness ? 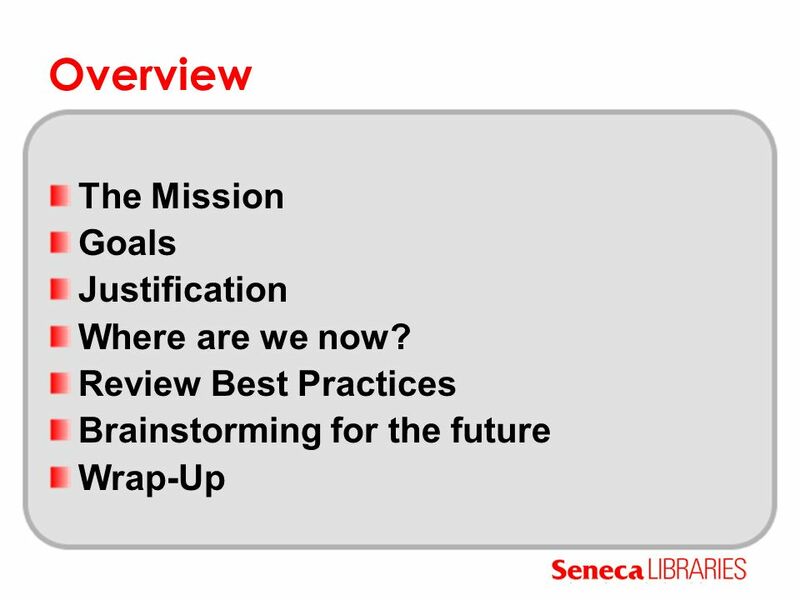 Focus on Technology with Wikis; Blogs; Content Management ? ? 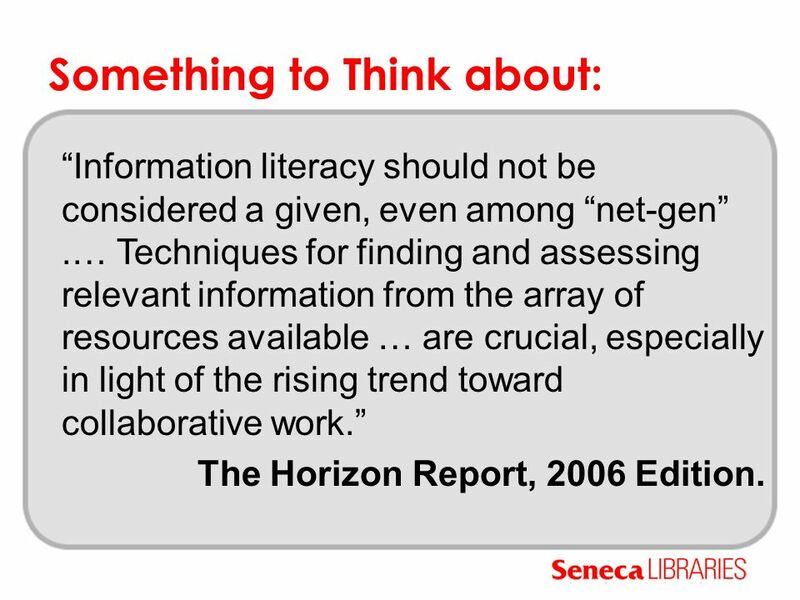 13 Something to Think about: Information literacy should not be considered a given, even among net-gen.… Techniques for finding and assessing relevant information from the array of resources available … are crucial, especially in light of the rising trend toward collaborative work. The Horizon Report, 2006 Edition. 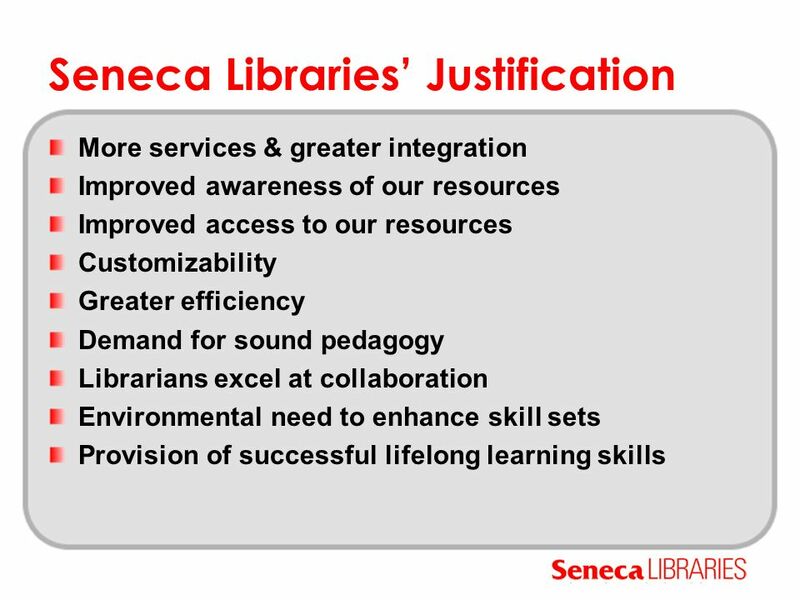 Download ppt "Information Literacy Roundtable April 2007 What does Seneca look like?" Do you have any of these characteristics? ability to thrive in changing environments innovation technological aptitude creativity service orientation. Cedarville University Accreditation Self-Study Plan Presented by Dr. Thomas Mach. March 2007 ULS Information Literacy and Assessment of Learning Program. Foundations of Excellence ® in the First College Year (4-year institutions) Salisbury University Project Description of Review Process of First College. The State of SLIS The State of SLIS Kimberly B. Kelley, Ph.D. Dean. How Does Accreditation Help us Run a Successful American School? Using the New CAS Standards to Assess Your Transfer Student Programs and Services Janet Marling, Executive Director National Institute for the Study of. Listening to the Future Presented by Larry Johnson and Kristi Nelson Transforming Lives, Education, and Knowledge. 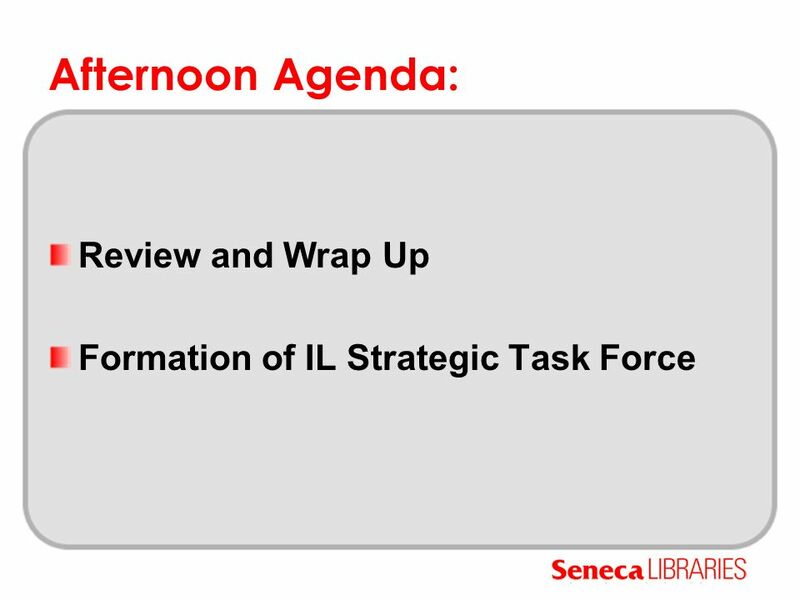 Strategic Plan Prepared by Melissa Druckrey and Jama Lumumba Jackson State University Division of Library and Information Resources. Information Literacy Demonstration – Partnership of Faculty and Library Gergana Georgieva Information Literacy Librarian August 25, 2008. 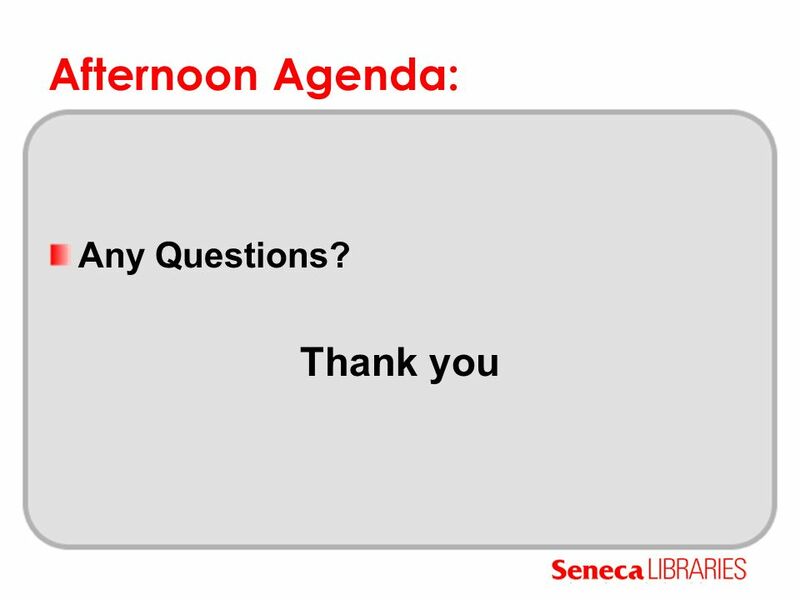 Liaison Librarianship: Relationship Building, Community Engagement, and Service Development Pam Ryan Director, Library Services Edmonton Public Library. 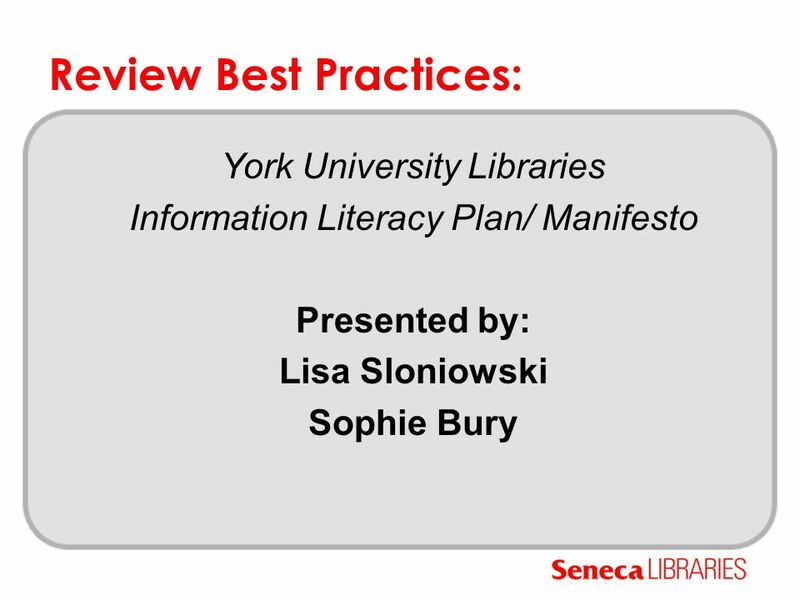 Faculty and Librarian Collaboration: Implementing the Information Management Competency Holly Heller-Ross and Trudi Jacobson. 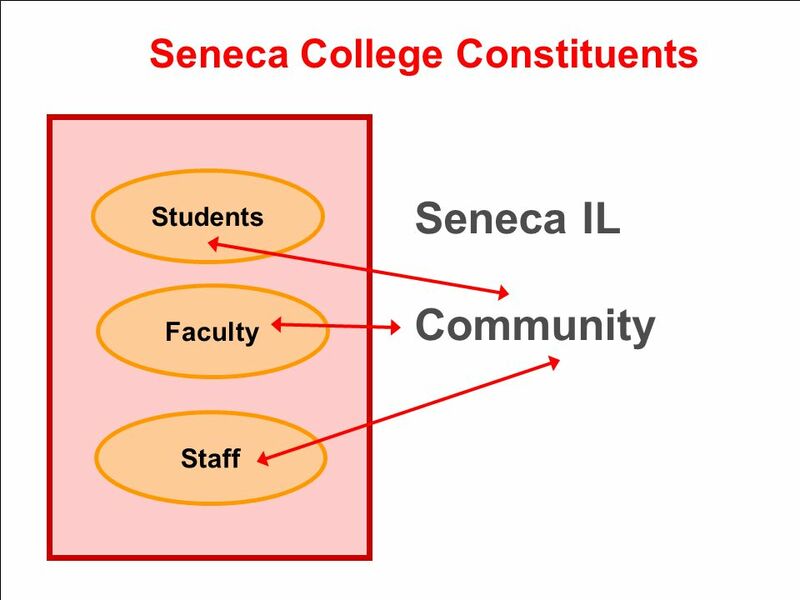 Standards 2.5, 3.3.1, & The institution engages in ongoing, integrated, and institution-wide research-based planning and evaluation processes that. 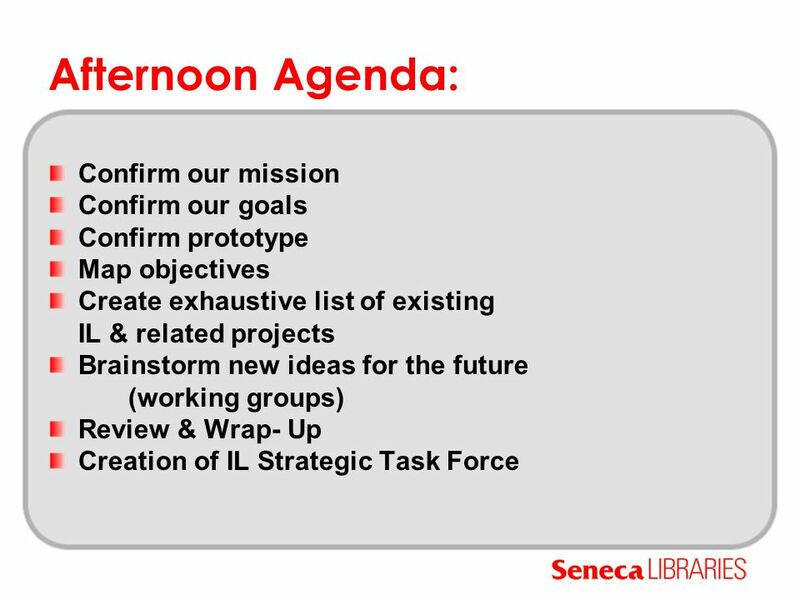 1 Strategic Planning: An Update March 13, Outline What we have done so far? Where do we stand now? Next steps?